More Galway related news. Irish game developers, 9th Impact (based in Galway) have this week launched the official Biker Mice from Mars game on iPhone and Android. The game is based on the smash hit 90’s animated TV series of the same name which was a staple of “The Den” programming on Network 2 from 1993 to 1996. The Galway-based company won the licence to develop the game following a competitive selection process during which they beat off larger international game studios to clinch the deal. Players choose one of the Biker Mice characters and ride through the streets of Chicago, following trails or battling enemies. Each level completed reveals the next instalment of the story of that episode. There are currently 2 episodes available, one clearly poking fun at a recent movie franchise and the other featuring a billionaire character running for President. There is an endless mode available for each episode to compete for highscores or to earn coins which can be spent on upgrades. 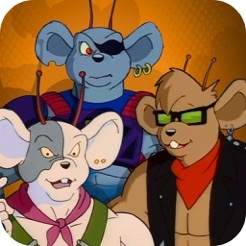 Biker Mice from Mars uses the usual swipe and tap controls from the endless runner genre but the lazer shooting, pursuits, boss fights and heavy use of story throughout make it a richer experience than the typical endless runners. The producers, artists and developers behind the game were all fans of the show since childhood. “I think the fact that we are huge fans is evident in the attention to small details throughout the game” says producer Mark Quick. Players unlock cards, trivia and mini-games as they complete levels or certain objectives in the endless mode. These cards are rich in detail from the show which will appeal to fans or newcomers seeking to learn what all the nostalgic fuss is about. Biker Mice from Mars is an animated series created by Rick Ungar which first aired in 1993. The series features 3 motorcycle-riding mice who escape a war on their home planet of Mars and arrive on Earth, crash landing in Chicago. Earth is in danger from the same fish-like race who destroyed Mars. One of the Plutarkian race, Lawrence Limburger, is disguised as a human business magnate and is trying to steal Earth’s resources but the Biker Mice are on hand to foil his evil plans. The show was hugely popular in many countries at the time of broadcast and gained a dedicated worldwide cult following over the years. The series spawned two previous games – one on the Super Nintendo console (1994) and the other on Play Station 2 (2006). 9th Impact is an award winning independent game development studio based in Galway, Ireland. The team of artists, engineers and producers are huge fans of Biker Mice from Mars and dreamed about building an awesome endless runner game for mobile. In 2014 the studio secured the licence to make the official Biker Mice from Mars game for mobile. The studio is currently working on new episodes to extend the action runner game and intends to develop an adventure style game based on the same series in 2016.